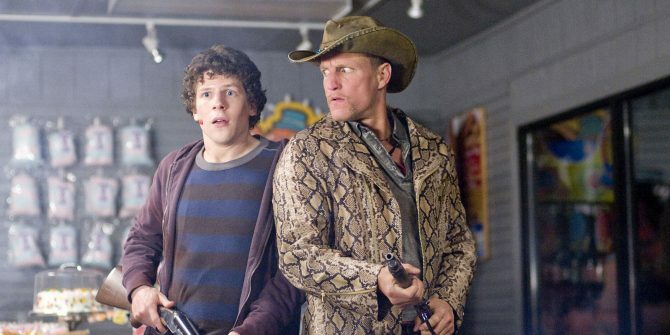 Now that he’s done with Sony’s Venom, director Ruben Fleischer is preparing to start work on the long-awaited Zombieland 2, the sequel to the 2009 horror-comedy that fans have been waiting years for. The best part about it is that it’ll reunite the original foursome of the first film. Namely, Jesse Eisenberg, Emma Stone, Woody Harrelson and Abigail Breslin. While speaking with ComicBook.com, Fleischer had a lot to say about the much-anticipated follow-up. As for why it’s finally happening now, the filmmaker explained that it was all down to how much everyone enjoyed working on the original. However, rightly so, the cast held off on committing to a sequel until the script – from Deadpool‘s Rhett Reese and Paul Wernick – was good enough. Now that it finally is though, the project’s ready go. As for whether there’ll be more movies after this, Fleischer passed on a great idea Emma Stone had suggested – that the cast and crew come together every decade to make a new installment in the Zombieland franchise. Despite how well the central quartet works together, Fleischer admitted that the sequel needed to inject some fresh blood to shake things up, so he’s currently looking to fill a few new roles. Finally, there’s one question everyone’s going to be asking about Zombieland 2: how can it top the beloved Bill Murray cameo from the first movie? Fleischer revealed that this challenge has occupied a lot of conversations, but he thinks there’ll be moments in the sequel that at least rival the Ghostbusters star’s iconic guest spot. Zombieland 2 is set to go before the cameras in January 2019 ahead of its release on October 11th of that same year, which will make the tenth anniversary of the first film. And as soon as we get any further updates, we’ll be sure to let you know.